Little Cultus Lake is 175 acres and is full of rainbow and brook trout, making both the lake and the campground popular with people who love to fish. 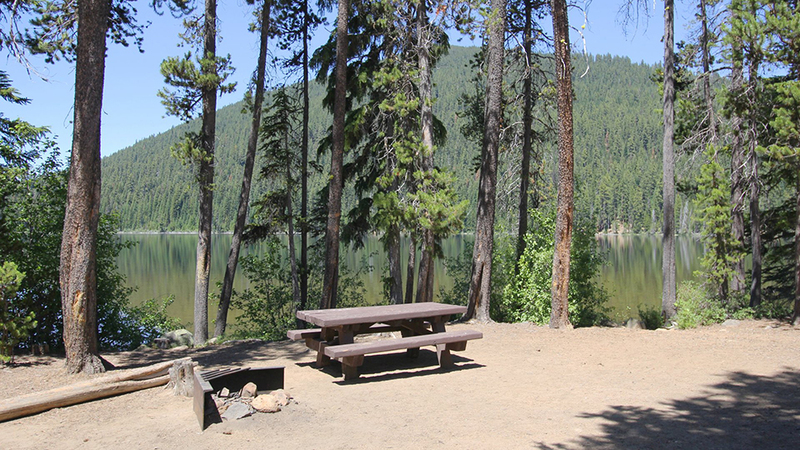 The campground also attracts a lot of families because the lake has a gentle, sloping bottom which makes it safe for well-supervised kids and ideal for wading and swimming. The campground has 29 sites located in a heavily wooded area next to the quiet lake (there is a 10 mph boat speed limit). The campground also has a boat launch, potable water, and vault toilets. Open seasonally, most of the campsites are well shaded and this is a great place to cool off during the heat of the summer. Sites are $16 per night for a single vehicle and, because of the dirt and gravel roads, may not be suitable for RVs. Fire has burned some areas of the shoreline, but Little Cultus remains a quiet place, particularly on weekdays. It’s the closest campground to the Pacific Crest Trail and also has easy access to many other hiking trails in the area.